Indigo has two water tanks – one in the bow and one under the aft quarter berth. Neither had gauges to indicate how much water was in the tanks. The fuel tank had a mechanical gauge built into the tank, but required lifting the floor board to check the level. The fuel gauge worked fine but I needed a way to gauge the water tanks, especially now that we installed the water maker. For years I have been eyeing the Hart Tank Tender because it is extremely accurate and uses no electricity. The system is based on air displacement and requires only a small tube to be inserted into the tank. A small manual pump is installed on the gauge and two or three quick pumps is all that is needed to get a reading on the gauge. The gauge is calibrated in inches and is much more accurate the standard empty-quarter-half-full indications of most electronic systems. I could have gone with a two tank model and saved a little money, but I decided to get the three tank model and plumb the fuel tank too. They are pricey, but not too much more than an electrical system (especially when considering the added cost of electrical wire and components). The hardest part of the install was figuring out where to install the panel. It is not small and I needed about 3 inches of depth to clear the pump and hoses on the back side of the panel. In the end, the only reasonable place was on the back side of the chart table. It is reasonably protected from accidental bumps and was a fairly easy place to route the small 1/8” hoses to it. Once the panel was fitted in place it was time to route the 1/8” outside diameter plastic hose. I protected it from chafe where it ran through bulkheads by using 3/16” diameter vinyl hose and securing it elsewhere using 1/8” screw in cable clamps. The bow tank hose runs under the v-berth following the existing water hoses into the hanging locker and then is routed under the lip of the settee back rest and into the chart table. The aft tank runs directly into the bottom of the chart table. The fuel tank hose runs through the bilge with the other cable run into the engine compartment, into the quarter berth seat (now the starter battery compartment), up behind the electrical panel and into the chart table. The tank sender is nothing more than a stainless threaded hose fitting with a 1/8”diameter plastic tube that goes into the tank. The fitting sticks up about 3/8 of an inch, so to protect it, I made a small mahogany trim piece that fits over the fitting and hose. I routed a small trough in the trim piece to accept the hose and cut a hole around the fitting. I had to make some adjustments where the hose exited the trim pieces to accept the bend radius of the hose and keep it from kinking. I then used double stick tape to secure the trim pieces to the top of the water tanks. To install the fittings I drilled a 5/32” hole through the top of the tank over the deepest part of the tank, and then used a 10-32 tap to cut the threads. Next, I inserted the tube, marked the depth and cut it back one inch to get the proper tube length. I screwed the fitting in place, plugged in the hose and done. Dead simple, extremely accurate, and never needs electricity or maintenance. The only thing left to do is to make a calibration card to convert inches to gallons. This is done by filling the tank 1 or 2 gallons at a time, taking a reading each time and writing it down on the card. The water tanks will be easy after I drain the tanks. The fuel tank could be that easy as well, but I don’t have enough empty fuel cans to drain all the fuel into and I don’t want to go buy them at this time. 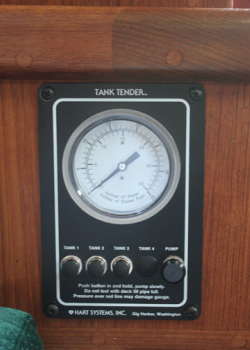 So for now I am comparing the tank tender reading with the mechanical gauge’s calibration card made the same way by the previous owner. Once I run the tank almost empty, I’ll follow the same procedure while filling it back up.